In 2005, I had a big bay window installed over my kitchen sink. Since I spend hours standing there, I reasoned I might as well look at something. I thought I was providing myself with a view of the garden, but it is the wildlife I’ve seen that has made that window worth every penny I paid for it. 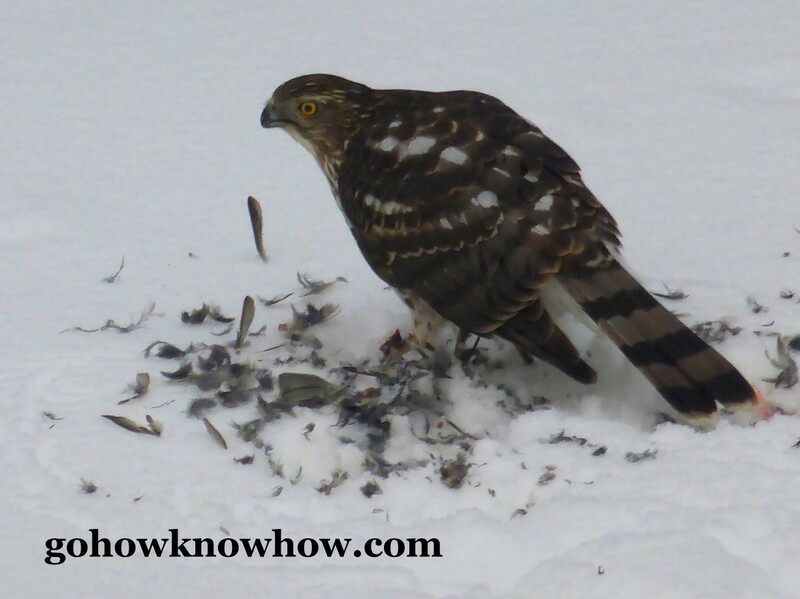 During the particularly harsh Connecticut winter just past, a Cooper’s Hawk downed a mid-size bird on the blanket of snow covering my back lawn and proceeded to spend 25 minutes consuming its catch. The hawk left his version of dirty dishes for me to clean up, while he cleaned his feathers from atop a nearby tree. Between that and the fox that crossed through the garden recently, I’ve seen some pretty exciting wildlife while still in my pajamas. That is not to say that there are not many good reasons to leave the house, and two of the very best ones hug the Gulf of Mexico; the Yucatan Peninsula and Florida’s Nature Coast both of which I traveled to recently. Not surprising, these were aquatic-themed destinations and I planned to spend my waking hours in or near the water armed with snorkel masks and binoculars. Here’s what I saw. 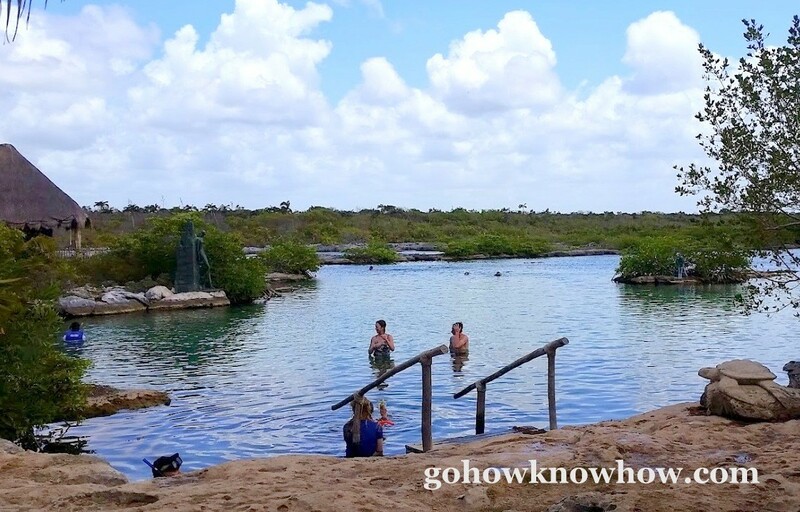 Located south of Cancun on Mexico’s Mayan Riveria, Akumal’s most famous animal resident has to be the sea turtle and indeed, Akumal means turtle in Mayan. There are lots of guided tours available in town, but I eschewed that and simply rented snorkel gear from the Akumal Dive Center (not to be confused with the bigger and less hospitable Akumal Dive Shop) got some advice about where to swim from the folks at the desk and plunged in right at their beach. I was not disappointed. Local rules require snorkelers to wear floatation vests so as not to step on the coral. I think it’s also a good idea because it makes the swimming nearly effortless and I could stay in longer before getting tired. The first critter to zoom beneath me was a lovely, very large, entirely white ray. This is as close as you’ll get to seeing something flying through the water and I watched as it flapped its wings with as much grace as a heron and slid past me on its way to thrill some other snorkeler. I was only 75 feet from shore when I spotted my first green turtle rising from a nibble among the green grass on the ocean floor to grab a breath of air. I’m told these animals can move quickly when they want but there were pretty blase about the tourists – and trust me there were plenty of them. That morning I saw many more turtles paddling leisurely and without any obvious concern about the orange-vested bug-eyed humans hanging above them. 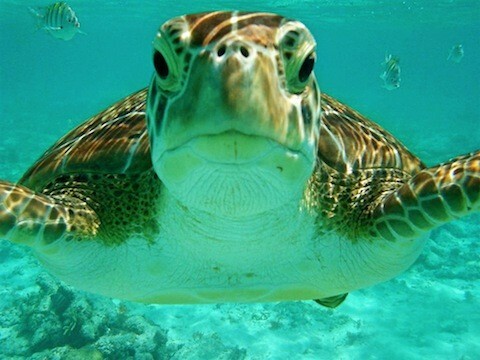 The other must-do snorkel experience is close by. 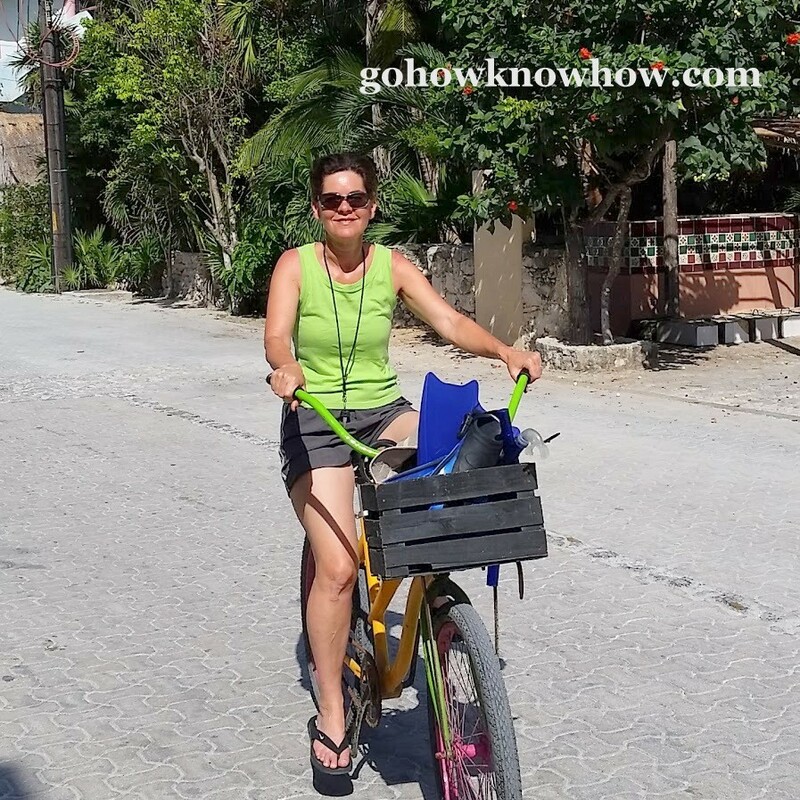 Rent a bike and pedal to Yal-Ku Lagoon located at the opposite end of Akumal Beach’s only road from the Dive Center.Throw the snorkel gear in the bike basket as I did and save the cost of renting gear there. The water is a mix of spring-fed fresh and salt water from the Gulf of Mexico, to which it opens. The lagoon is so clear you can see the fish before you even get in the water. This is a large rocky area with lots of nooks and underwater alleys to explore. 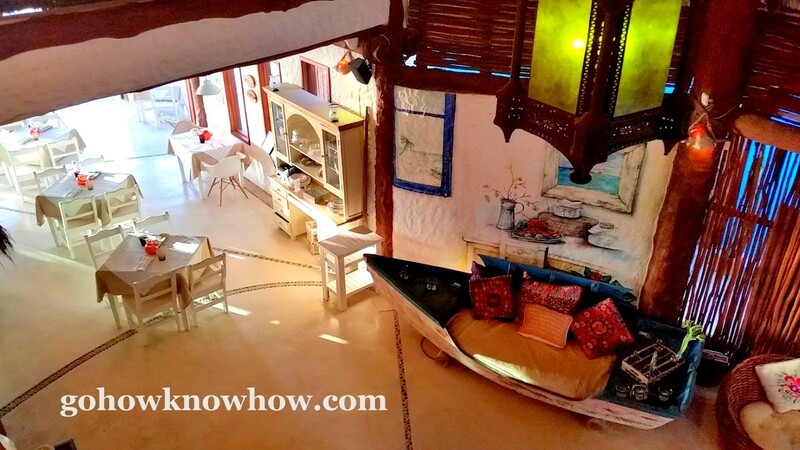 Even less known than Akumal, Holbox is an island in the Gulf of Mexico located a two hour drive north and west of Cancun in the Yum Balam Nature Reserve. 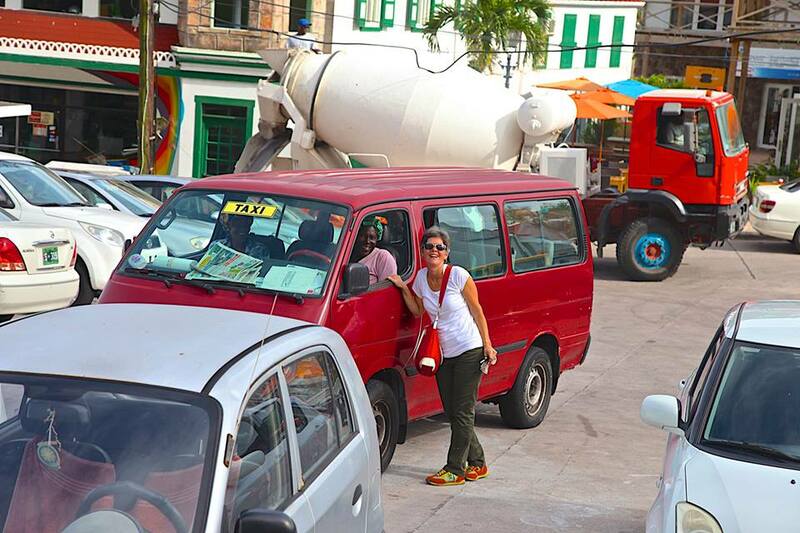 This is old Mexico, a charming fishing village with sand streets, golf carts instead of cars where locals and tourists mingle in the shops and restaurants and certainly on the beach. Most of the island is uninhabited making it the perfect place to see nature, while still enjoying the comforts of air conditioning and screens to shut out mosquitos. 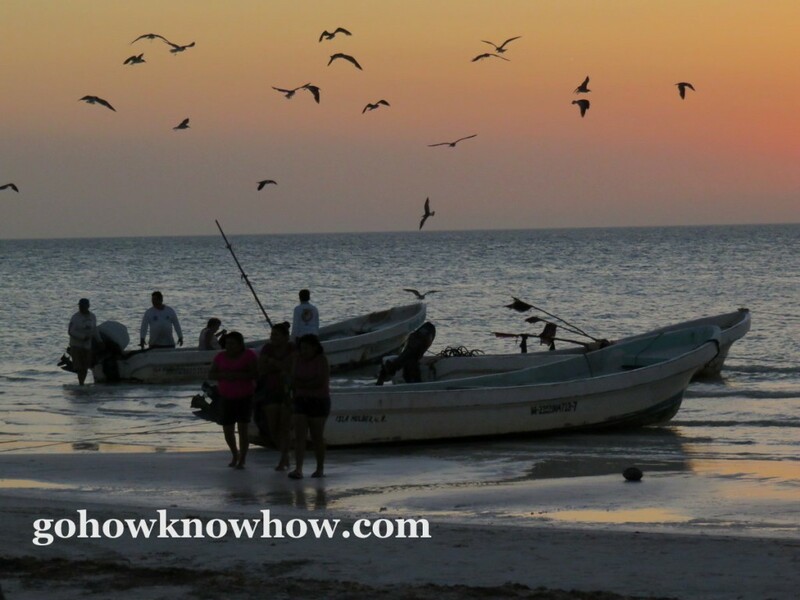 I stayed at the utterly charming Casa Las Tortugas where from the balcony in my room I looked out on the beach and I could watch the pelicans fishing for breakfast above the human fishermen heading out for the day. I took a bike and pedalled east along the water’s edge stopping often just to listen to the cacophony of birdsong. I stopped at an inlet and watched the ospreys start to panic (as they always do) at the sight of an interloper in their environment. But the grand prize of the day was coming upon a flock of flamingos on my return to town. Full disclosure I would not have noticed them but for a group of teenagers shrieking and pointing at a half dozen black tipped, pink birds who filled the air over a sandbar. 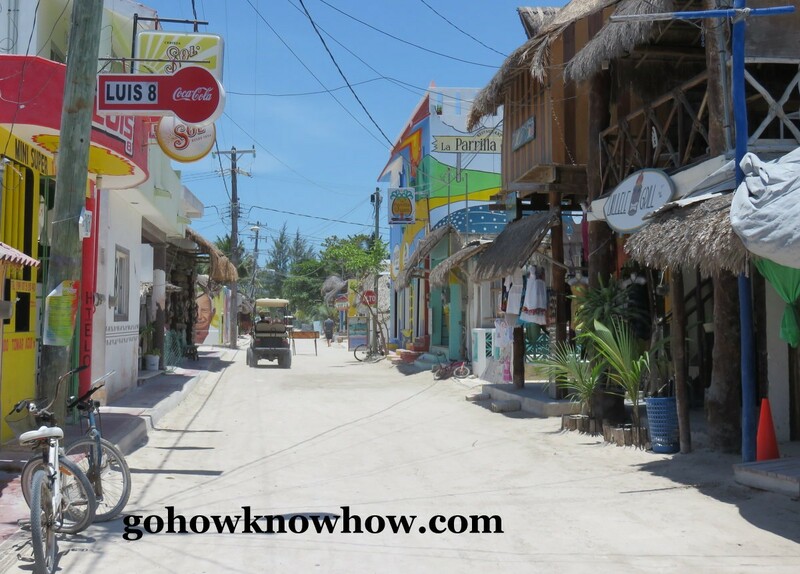 Holbox (don’t do as I did and pronounce the X, it’s Hol-bosh) is home to the Whale Shark, an enormous fish that, thankfully eats only tiny fish. Had I enough time on the island I would have gone on one of the many boat trips out to see them feeding on Gulf plankton, but that will have to wait for my next visit. When the sea creatures are 45 feet long, and have the word “shark” in their name, I find it very comforting to know they are not interested in eating anything as large as a human. I feel the same way about the Florida manatee, the Florida’s official marine mammal. They’re big, they’re prehistoric they’ll swim right up to you and thank the Lord, they only eat grass. The water in the Crystal River about an hour north of Tampa, is so clear it is easy to see the manatees from land or on the water. 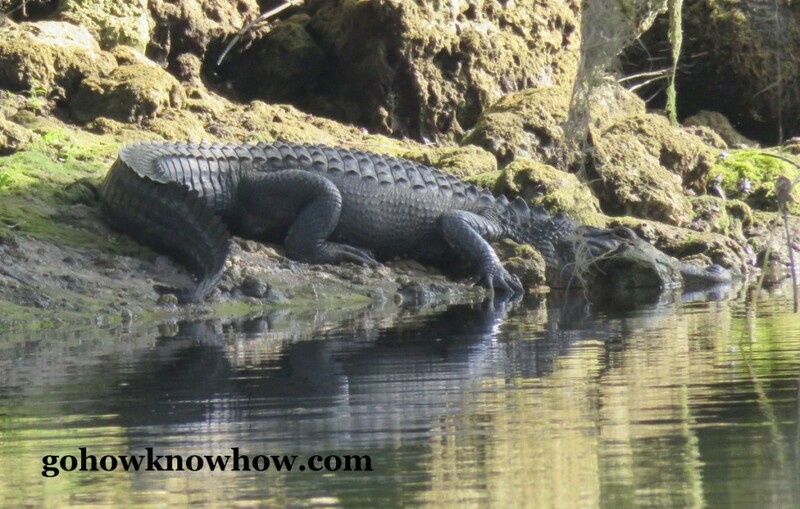 So my first day at the Plantation on Crystal River, I paddled around in a kayak watching them come up beside my boat. I also happened to spot a Florida gator but that’s another story. 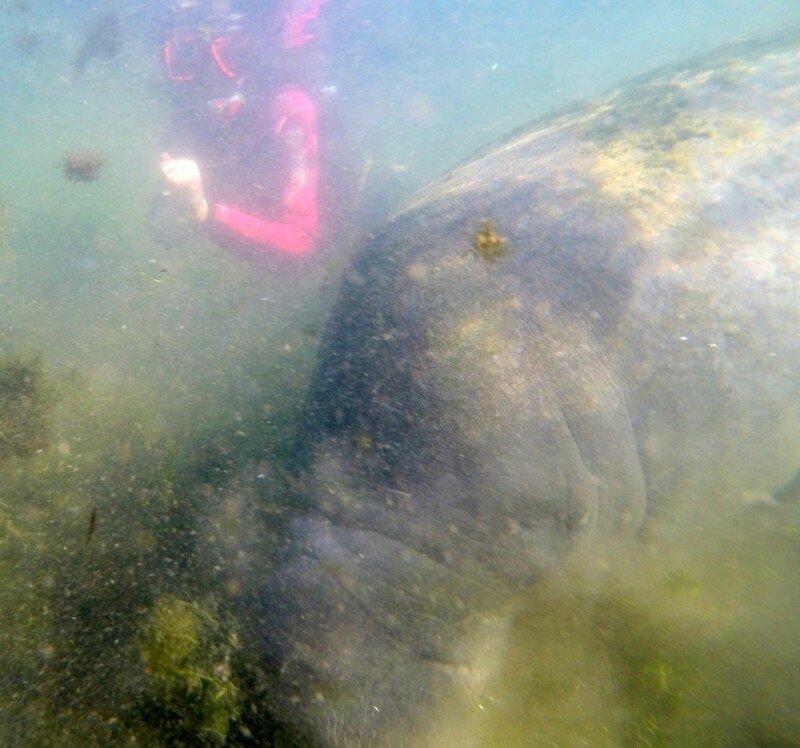 The following morning, I suited up in a buoyancy-enhancing wet suit and joined the Adventure Center’s official manatee tour so I could get into the water and swim with my favorite critters. Capt. Ed Menster who spends most days showing the sea cows to tourists has come to know some of the manatees’ individual habits so he took us down a small waterway and encouraged us to spend time there despite the fact that it was a rather murky body of water, with little to see from the surface. There was a mother and baby who frequented there, he told us. It might be worth waiting around. So we did. Still, I was not prepared for what happened right before my eyes. 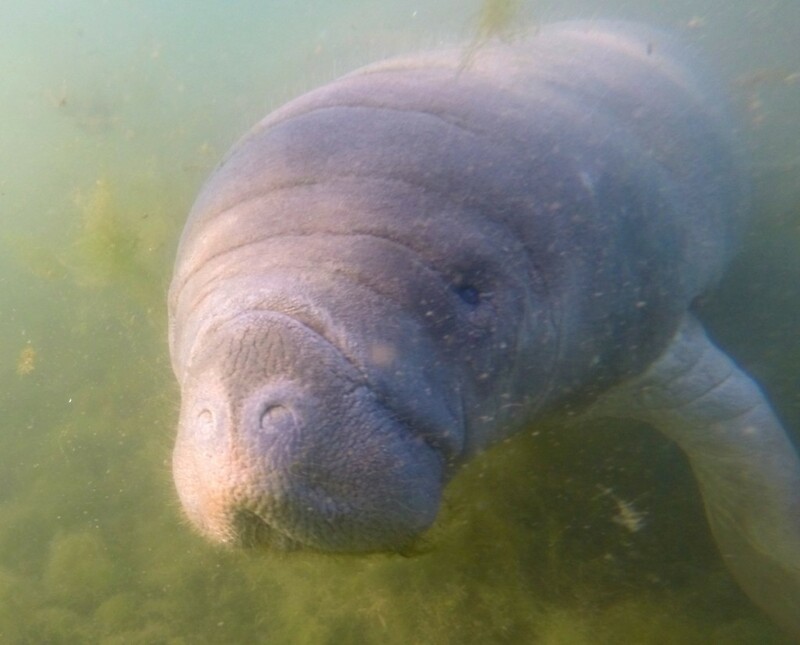 I was concentrating on trying to see through the opaque water when suddenly, rising inches from my mask, was the pie-shaped face of a baby manatee. It rose silent and steadily as if riding on an elevator. In fact, it was atop a larger, equally adorable momma who was pushing herself and her baby up towards the surface. Surely my eyes were popping out of their sockets. The two manatees looked equally surprised. Then, as quickly as they arrived, they descended to the grassy bottom to continue whatever they had been doing just below, but invisible, beneath me. We saw many other manatees that morning. Some sleeping, most eating and another baby nursing just below the mom. And no matter how many we saw, the experience was other worldly. 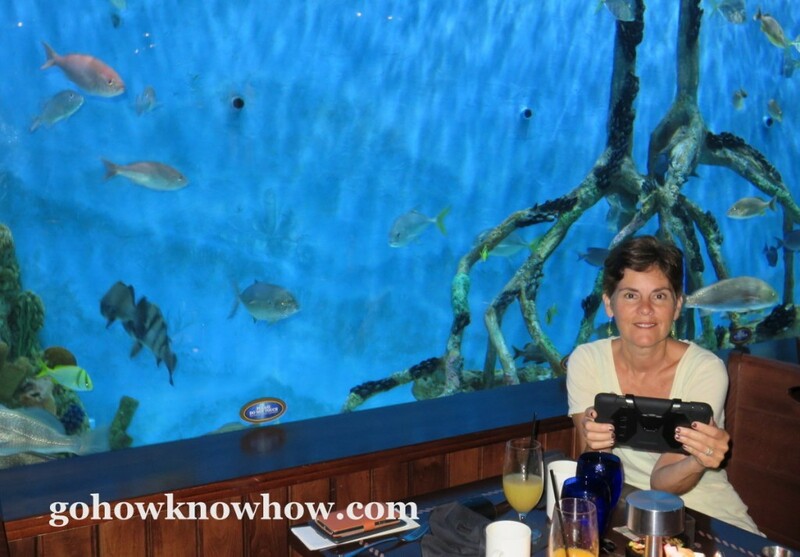 Hours before I joined the fish in their 33,500 gallon home at the Tradewinds Resort in St. Pete, I viewed them through the glass like all the other diners at the Guy Harvey Rumfish Grill. The sun was blazing outside but inside the lights are dimmed the better for all of us to focus on the crystalline blue fish tank and its assortment of native species It was beautiful to watch them and, using the tablet provided by the restaurant, to identify the ones we saw. That would have been enough, but how could I say no to an offer to jump on in? I could not. 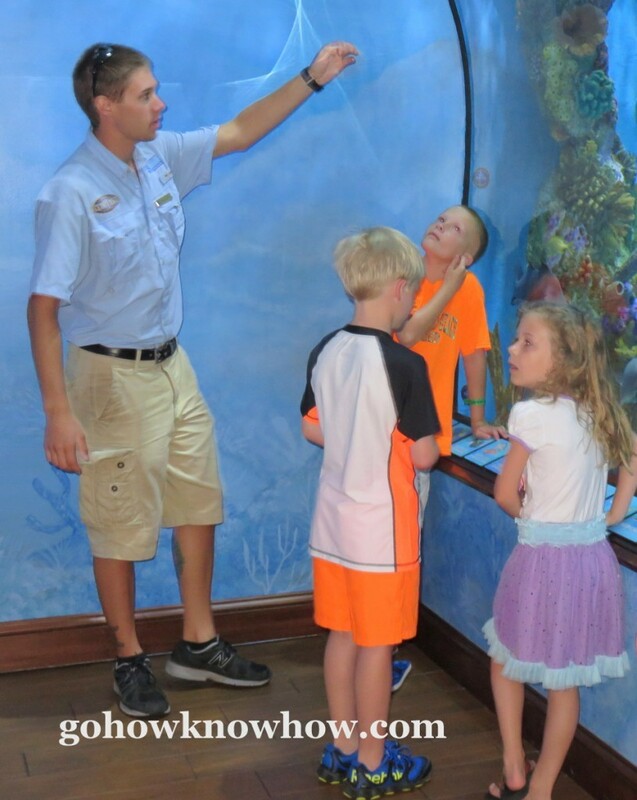 Aquarist Bradley Burge took a half dozen guests of the Guy Harvey Outpost on an hour long backstage tour, explaining all the technology required to recreate Florida’s Gulf of Mexico inside a restaurant so that visitors can have an immersive lesson in local ecology. “It’s education we offer,” Bradley told me as he explained the end goal of the resort’s swim with the fish program. “The understanding of our local marine environment, the fragility of it, the ecosystem, making sure people are aware of those different things and how important they are,” he said. 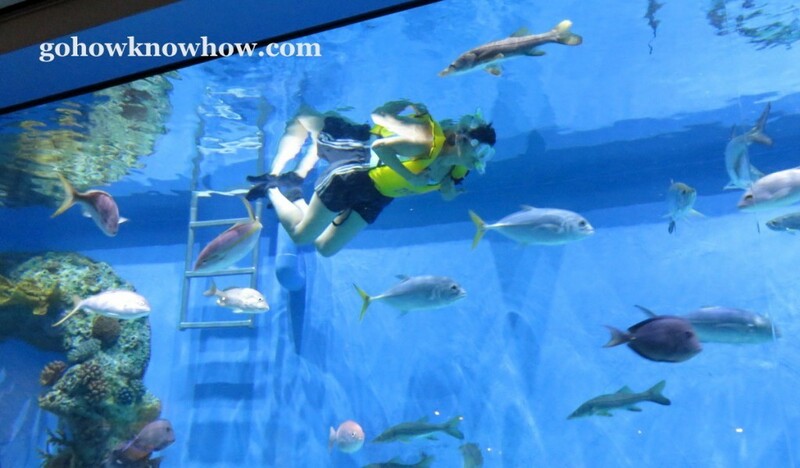 When swimming with native fish in a tank designed to replicate the Gulf of Mexico one does not just do a swan dive into the tank. 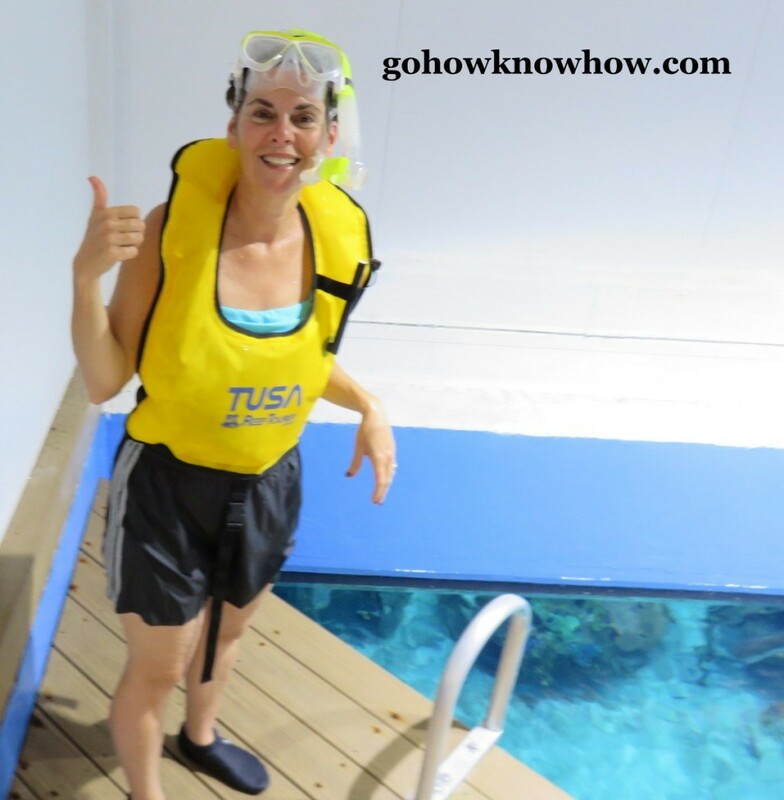 I was showered, lectured to, garbed in shorts, aqua shoes and gloves and given the rules of the swim before I was allowed to step onto the ladder and descend into the tank. Bradley promised it was worth the build up. “When it comes down to it there’s nothing like you being next to fish and being up close and personal to them,” he told me. Tentatively, I submerged and in seconds what from the outside had been a pretty backdrop was marvelously transformed. I’d arrived in a completely different world and realized Bradley was right. Whether it is the underside of the sea’s surface or the inside of an aquarium, there’s a lot to be said about traveling to the other side of the glass. Yikes: I was recently at that same Tradewinds Resort for a biz meeting and saw only conference rooms, restaurants and noisy tourists… Clearly I should be traveling with you, because you KNOWHOW!